Last weekend was all about pasyal. Well, we did stay at home but went out both days (Saturday and Sunday). While I try to stay at home one whole day (normally Sunday) during weekends, things don’t go my way every time. Sometimes, the hubby makes lambing and asks me to go out. He’d usually say it’s going to be his treat so I wouldn’t have a reason to say no. Bakit naman ako tatanggi sa libre, diba? Basta hindi magagalaw ang weekend budget ko, tara, let’s go! Haha. Sometimes, I think the hubby is my balancer. I’ve been trying to be frugal and live simply but there he is, spending whatever extra cash he has instead of using the money to pay his debts because he believes he’d receive a windfall sooner or later (which is almost always true, anyway). Also, whenever I’d think of buying a big ticket item for myself and having second thoughts, he’d convince me to purchase it and even take my worries away by shouldering a part of the item’s cost (which would make me thrilled and grateful, of course). He said he’s one with me in achieving our financial goals naman but his actions are saying otherwise, at present. Let’s see next year when we finish paying for our car. Anyway, on Saturday night, after hearing the anticipated mass at the National Shrine of St. Michael and the Archangels, we went to Prism Plaza located at the fourth level of Two E-com Center, MOA Complex. Influenced by my blogger friend (who is also his friend on IG), he wanted to check it out because it transforms into a relaxing hang out place at night. 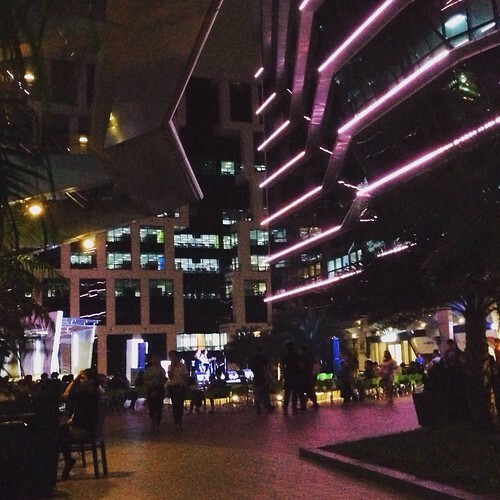 It has several restaurants and a huge al fresco dining area complete with a live band. Plus, it has a beautiful landscape garden and offers a nice view of Manila Bay and the entire MOA Complex from different standpoints. During our visit, there were several groups having a good time already. We chose to have dinner at Up Rice Manila. 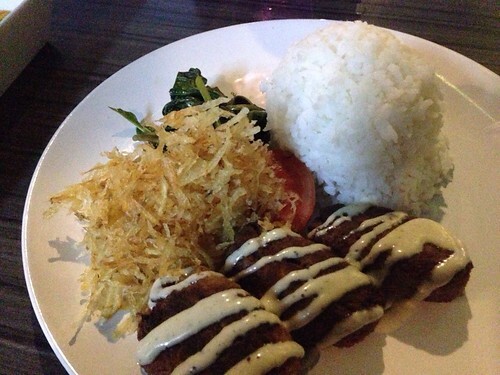 The resto serves Asian cuisine at reasonable prices. The hubby settled for their beef kebab while I had their sausage and red pesto. We also got a plate of nachos which we munched on while waiting for our individual orders. I’m happy to report that Up Rice Manila didn’t disappoint. Our food were yummy and nicely-presented! We reached Bacoor just before 11PM. The next day, Sunday, we woke up at past 10AM to make up for our sleeping late the other night. We made a quick trip to the nearest 7-11 store to get some breakfast and from there, we drove to the wet market to buy fresh produce. Lunch a few hours after would be pork sinigang. Our Sunday afternoon was spent doing the laundry and taking a two-hour siesta. That night, we drove to Starmall Prima. A friend of the hubby’s told him that the Coffee Bean and Tea Leaf (CBTL) branch there was open already and he suddenly wanted to check it out. He said he also wanted to study there, except he was telling a half-truth. 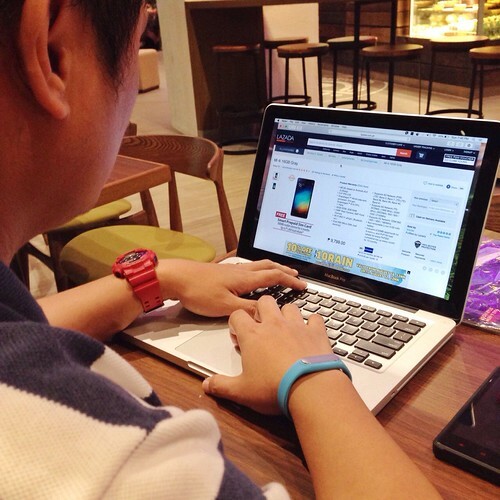 Look at the photo below, I caught him just browsing gadgets on Lazada.com! Para makabawi, umorder nga ako ng Triple Decker cheesecake na in fairness, ang saraaaaap! Don’t worry, I shared it with him. He had two forkfuls of it. Haha. 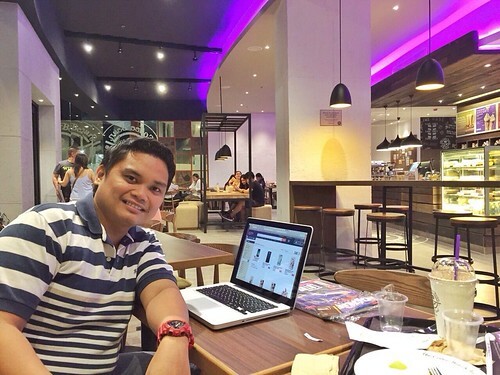 After hanging out at CBTL for a few hours, the hubby and I went home already. Probably that’s the reason kaya bagay na bagay kayo kasi balance lang eh. hehe! I saw that Prism Plaza last weekend and saw how shala looking it was from below. Jan pala located ang uprice? kala ko sa ibang building. hehe! I saw kasi a voucher at metrodeal ata kaya lang failed to buy one. I also saw that bldg from one of my ex-colleague. They posted that too on IG. And ang cute tingnan kasi may mga ilaw parang disco lang sa gabi. Feel na feel ni hubby ang solo pic sa CBTL ah. Nyahaha! 🙂 I also try to be frugal pero kalowka ang hirap. But I’m trying. Really trying. 🙂 Relate ata ako sa hubby mo. Hihihi!